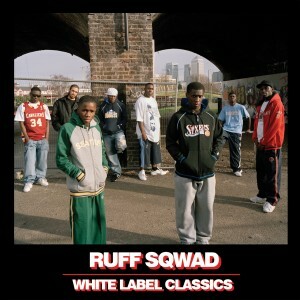 In 2001, a group of teenage producers from Bow started what is referred to as one of the cornerstones of grime, Ruff Sqwad. Gaining popularity through the pirate radio culture, Ruff Sqwad quickly gained critical acclaim with their unique sound and consistent production. Over the years, Ruff Sqwad became a household name to grime heads and still remain a respected outfit to discerning fans. As a tribute to this, No Hats No Hoods has out out an extensive release featuring the classic tracks that were until now only available at the pricey discretion of Discogs sellers. Featuring tracks that span the spectrum of Ruff Sqwad's existence, this compilation is a testament to Ruff Sqwad's sound and the beginnings of grime. Appropriately named White Label Classics, the compilation is being released on CD and digital, with each featuring two exclusive bonus tracks on top of the twenty instrumentals. The CD will include "Lonely People" and "Died In Your Arms", while the digital package will include "No Bass" and "Cleo (Remix)" as the bonus tracks. Additionaly, the CD will also include a 16 page booklet with artist interviews and track information. Ruff Sqwad was recently the spotlight on a rather large lineup for the always relevant and on point Boiler Room, which included additional performances from Slew Dem, Plastician, and many other seminal grime players.